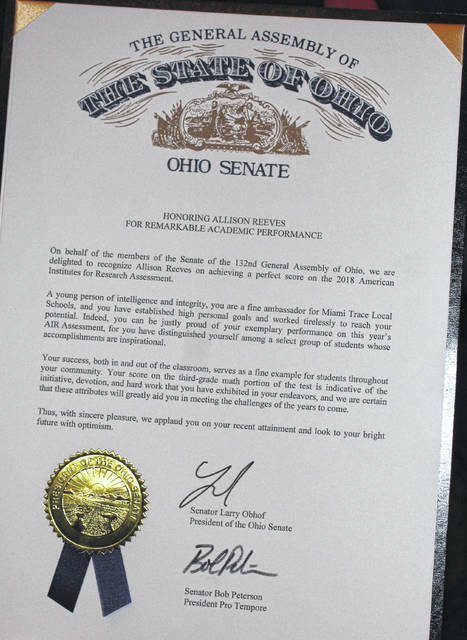 On Tuesday, Jan. 15, a number of Miami Trace students were honored for their exemplary performance on an Ohio State Test (OST) administered this past spring. Senator Bob Peterson and Representative Gary Scherer provided honorary letters for all students. All of these young people are to be commended for their hard work and dedication to academic achievement. (front, l-r); Sen. Bob Peterson, Landon Pucket, River Havens, Ashlyn Davis, Alyvia Atkinson, Isabelle DeBruin, Jameson Hyer, Brianna Parker, Hailey Webster, Alex Robinson, Wyatt Rogers, Kamika Bennett, Alainee Wolffe, Elizabeth Turner, Samuel Stoughton, Allison Reeves, Emma McCullah; (back, l-r); Grant DeBruin, McKenzie Seyfang, Trey Robinette, Justin Thompson, Cassandra Miller, Hannah Houck, Emma Trimble, Emily Turner, Kaley Moser, Pierce McCarty, Lucas Cornett, Elijah Daniels, Robert Bennett, Jyllian Skaggs. Not pictured, Justin Glass. Here is what the students received from Senator Peterson.